The last day of July, which also happens to be my son's birthday. This year he turns 13. Where has my baby boy gone? Time is just flying past so fast. I must be getting old! And now we're heading into August and we haven't even had a summer. Plenty of parcels being delivered over the past 4 weeks containing a real assortment of foodie goodies. I've also got a giveaway this month of two products that I've been really impressed with. More of that and details of how to enter at the end of this post. Breakfast. The most important meal of the day. We all know that but hands up those who admit to rushing out the door on an empty stomach?! I find breakfast biscuits a really useful grab and go option on days where time is tight. 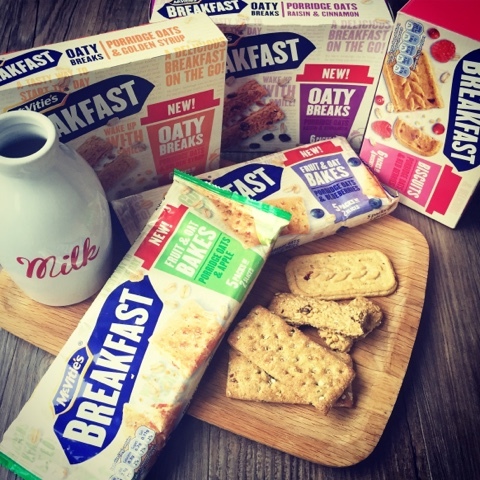 McVities have recently launched a couple of new additions to their range which now comprises of Breakfast Biscuits, Oaty Breaks and Fruit & Oat Breaks. The biscuits are pretty much on par with others I've tried and the Fruit & Oat Breaks remind me somewhat of Garabaldi biscuits. However the big hit for me are the Oaty Bakes. I just can't get enough of these. Loved the Raisin and Cinnamon so much that I was reluctant to try the Porridge Oats and Golden Syrup variant but it's just as good. Crunchy, crumbly and almost granola like. Snapable fingers without the guilt of them being chocolate ones. I've been enjoying them washed down with a homemade breakfast smoothie. My one of choice at the moment is Strawberry, Blackcurrant & Coconut Water. Thankfully I took a quick snap of The Foodie by James Steen before I packed it in my holiday suitcase. It's now suffering a wee bit with water damage, sand and suncream stains! 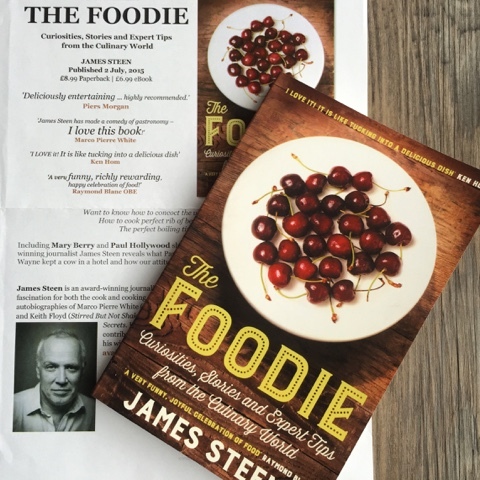 Its author James is an award-winning journalist and food writer who has ghost written the autobiographies of Marco Pierre White, Raymond Blanc and Keith Floyd. "The Foodie" comprises curiosities, stories and expert tips from the culinary world alongside anecdotes from celebrity chefs. The book is easy reading for a foodie like myself, full of interesting snippets and food history. It contains a mishmash of fascinating facts, some of which were new to me and others that I'd already picked up along the way. Rather than read cover to cover I dipped in and out and will hang onto it as a reference book but not for the preparation advice on how to eat garden snails. Published by Icon Books, £8.99 paperback, £6.99 ebook. My next parcel is a sneaky peek at a new gadget from Zyliss which I'm going to be using in a recipe development project for them. It's an EasyPull Manual Food Processor. I think it's going to be really useful for camping and my outdoor foodie and foraging events. So far I've used it for making salsa and breadcrumbs and its great for onion chopping without tears. 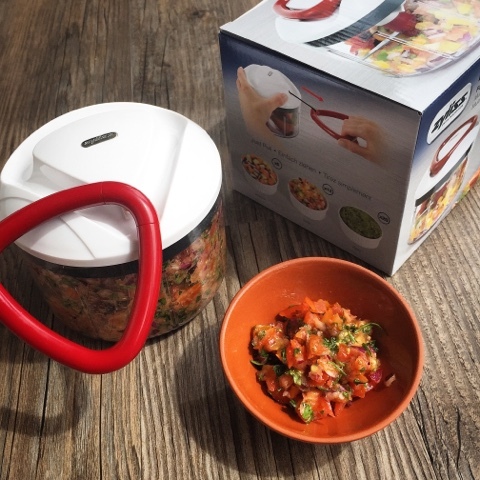 Perfect for those small jobs that you don't want the hassle of pulling out and washing up a full sized electric food processor for. Watch this space for the full review to come and my commissioned recipe. 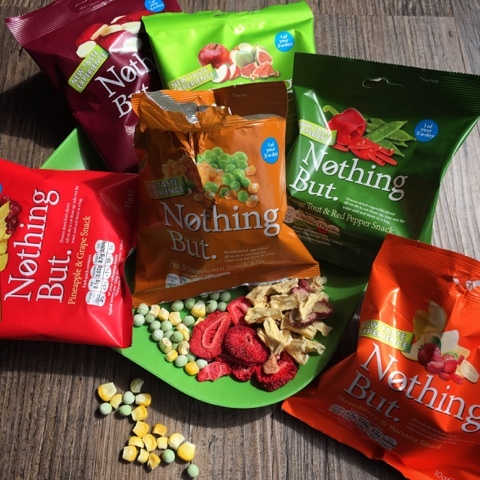 These bags of snacks from Nothing But have the crunch of crisps with nothing but freeze dried fruit and vegetables. Low calorie snacking (26 - 76 cals per bag) and each bag is one of your five a day. The fruit and vegetables are quickly frozen to lock in the nutrients then sliced into bite sized pieces before the ice crystals are removed by freeze drying. I love the pineapple, girl can't get enough of the grapes and the strawberries taste like fizzy sherbet! The vegetable variants really weren't my thing, I liked the almost foamy/polystyrene texture of the fruit - almost like space food - but prefer my veggies fresh. 3 fruit and 3 vegetable varieties, rrp £1.25 per bag. Postal subscription services for food boxes have really taken off in recent years both as as gift options or as a monthly treat for yourself. 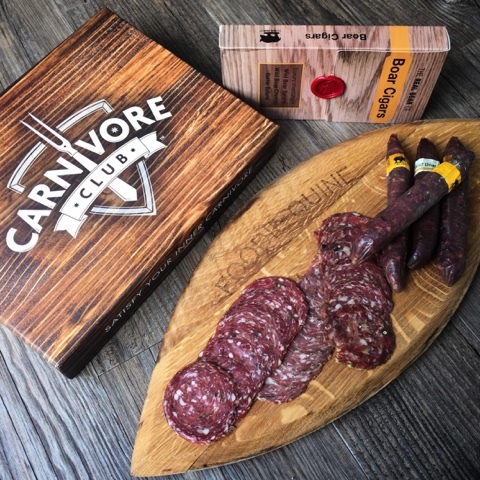 Carnivore Club UK is a monthly delivery service of British Artisan Charcuterie. The meats in the box change every month and the featured supplier the the first box I received was The Real Boar Company. In my parcel were wild boar cigars, duck and plum salami and wild boar and venison salami. Within the selection of cigars my absolute stand out favourite was the Game Salami. The price point for the box is definitely that of a luxury product and it does enable you to explore different charcuterie that you many not have otherwise discovered on your own. However I felt the quantity in terms of product weight was a bit lacking on this occasion but there was no mistaking the quality. I've got another box still to come and look forward to tasting its contents. The letterbox snack folk at graze.com have recently launched a new range of mini snack boxes. There's a mix of sweet and savoury within the dozen now available and my particular favourites were the Smokehouse BBQ Crunch (BBQ peas, corn chips and jumbo chilli corn) and the Salted Fudge and Peanut Cookie (St. Ives Cornish vanilla fudge with mini chocolate cookies, redskin and salted peanuts). 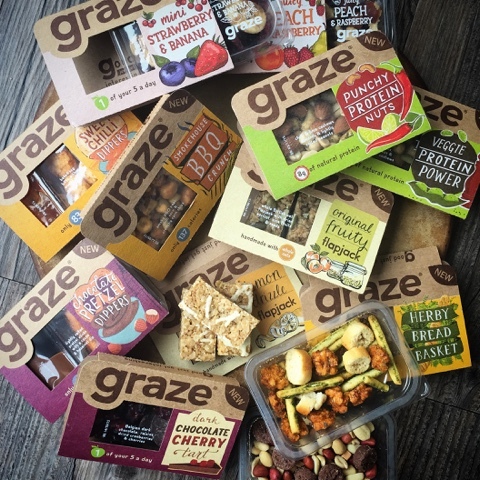 Over the last 7 years millions of online ratings have been gathered by graze about what people love to snack on and now their snacking expertise is available on the high street as well as online. Some packs count as one of your 5 a day, others are natural sources of protein and none contain any artificial flavours, colours or preservatives. rrp £1.19-£1.49 Sainsbury's, Boots and WH Smith Travel. 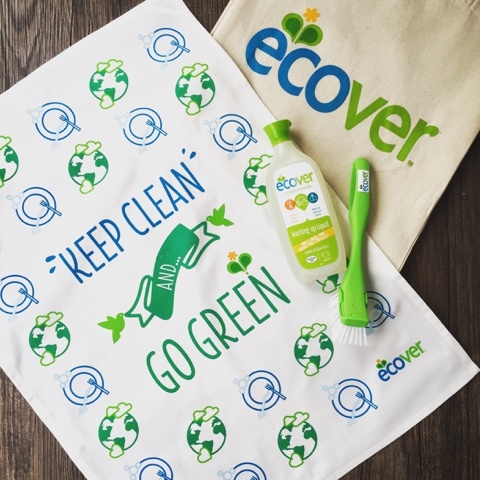 Green cleaning company Ecover have launched a new and improved washing up liquid and sent me some to try out as part of their #greenandclean challenge. I knew of the brand but hadn't used their products in my home although we do always use their hand wash at our outdoor Mud Pies & Foodie Quine events. The new formulation claims to wash up to 40% more plates and perform just as well as conventional cleaners. I set it the hard task of washing all the dishes from a day in the woods with 80 people making pancakes, blaeberry jam and toasting marshmallows. It handled the challenging task really well ably assisted by a recycled washing up brush. I absolutely loved the natural Lemon and Aloe Vera scent. 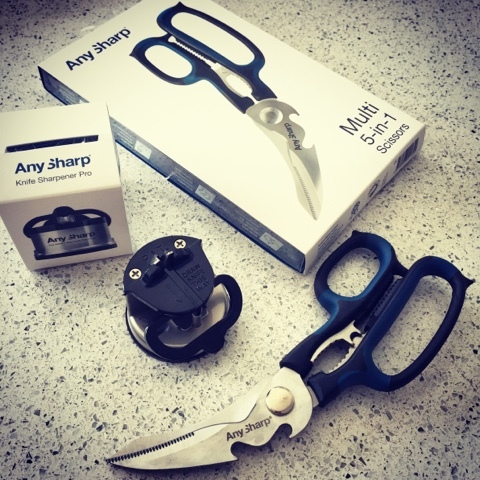 And now to my final parcel of the month which contained a Multi 5-in-1 Scissors and Knife Sharpener Pro from AnySharp. When I posted about these on my Facebook Page I got lots of comments from people who already had one or the other and loved them. Always a good sign. Also picked up a couple of tips about their usage. Wash knives after sharpening to remove shards of metal and don't put the scissors in the dishwasher as it stiffens them. Time for me to try them out for myself. The first thing that impressed me with the sharpener is that it can be used for serrated blades as well as standard knives. None of my serrated knives have ever been sharpened. I've got a steel which I do use for sharpening my knives but I'm never sure if I've got the angle right. With AnySharp all the guess work is removed. Attach it to any smooth surface with its suction cup base, gently draw the blade through 3 or 4 times and sharpness is restored. Is it possible to get excited about scissors? I didn't think it was but the Smart Scissors are already proving to be very useful in the kitchen. I haven't tried them in all 5 ways but they can open a bottle and cut trough almost anything with ease. \Meat, bones and an old sim card. Birthday Boy has confirmed they work well if you are left handed. Don't be put off by their rather odd looking shape as they are really comfortable to use. 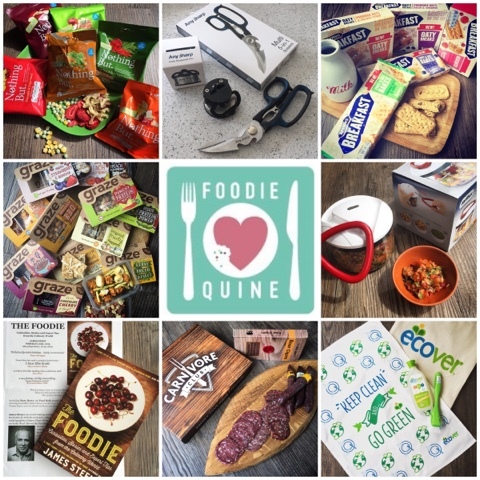 Anysharp have provided both items (Knife Sharpener Pro RRP £17.49 and Multi 5-in-1 Scissors RRP £14.99) as a giveaway for readers of Foodie Quine. Entry is via the Rafflecopter widget below. To enter, let me know in a comment "What's your most used kitchen utensil?" For additional bonus entries you can follow me on Twitter, Tweet about the Giveaway or like me on Facebook. Giveaway ends 14th August 2015 12:00am. Good Luck! Disclosure : Thanks to McVities, Icon Books, Zyliss, Nothing But, Carnivore Club, graze, Ecover and AnySharp for providing the above products. I was not obliged to review positively in return. All views expressed are my own. This is not a paid post. Probably a pair of scissors as I have ben adopted by an older cat who needs the meat I give him to be cut in small portions. Food parcels in the post have to be the most wonderful thing. I particularly the look of the carnivore club! Has to be the large chef's knife. As well as it's main purpose (Cutting), it is large enough to use as a spatula. I tend to turn things over with it when using saute pan. I love food parcels as it gives us a chance to try out some new products. I love the scissors and gadgets too. my set of knives, always handy! My pair of Sabatier Santoku knives. I cook a lot from scratch so these knives are used daily for preparation of all my meals. Hard to say, but probably the kitchen scissors, or the vegetable knife. The kettle - I'm always having a brew! my cooks knife - struggled for ages with other knives before finally investing in a proper cooks knife and now love it! The Kettle - it never gets a moment's rest! My really cheap electric hand whisk, gets used the most and is probably the cheapest gadget I own! my colander - it is the holey grail! The scissors - I can't seem to get anything open! My cook's knife definitely gets the most use of all the utensils! I would agree with a lot of the comments on here about graters, knives but I will go with a spatula. I have several but one of the best is from the Jane Asher range at Poundland! Probably my Kenwood Mini Chopper. That thing is awesome. My stick blender - it's amazing what I can mae it do without dragging the food processor out! My chopping board, whether as a surface for chopping, mashing, or peeling, it gets used all the time. Mines got to be the Potato peeler. The kettle, cant stop having tea. My chopping knife does everything from chop veg to open parcels! My blender is brilliant, I couldn't do without it now. My chopping knife is always in use. My knife, I love chopping veg. The wooden spoon is used for everything. My ceramic utility knife is probably my most used kitchen item. Probably my bread knife, I use it for all sorts of things. I thinks its the cheese grater that I use the most! My small black handled knife. use it every day over and over. My silicon spatula. I use it for almost every meal preparation. Our knife, although the end has fallen off now, ha ha. Little black knife that is used for everything!